The Electronic Frontier Foundation comes out swinging with a new "in defense of users" campaign aimed at convincing tech companies to oppose Trump. Also, Apple CEO Tim Cook tells employees on a private message board that new Mac desktops are in the pipeline. Short takes and quick hits for the week of December 19-25, 2016. The Electronic Frontier Foundation isn't waiting for the Presidential inauguration on January 20, 2017, to express their opposition to incoming President Donald J. Trump. 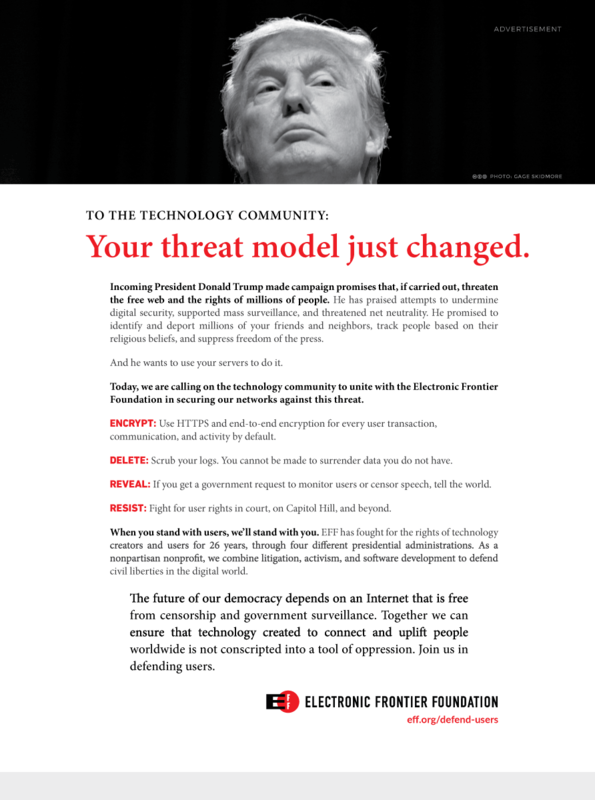 In a full-page ad that appears in the January issue of Wired, the EFF is warning tech companies that "Trump and many of his advisors have promised to ratchet up surveillance and censorship ... And he wants to use your servers to do it." Best practices for deleting unnecessary user data and encrypting communications. The new campaign comes on the heels of a widely publicized meeting last week between Trump and top executives from leading tech companies, including Apple, Google, Microsoft, and Facebook. So far, the President-elect has not responded, on Twitter or elsewhere. On a private message board for Apple employees, CEO Tim Cook has answered a flurry of questions. His remarks about last week's visit to Trump Tower have received the most publicity, but some remarks about the future of the Mac are worth calling out as well. The remarks are highlighted in a report from Matthew Panzer on TechCrunch. The desktop is very strategic for us. It's unique compared to the notebook because you can pack a lot more performance in a desktop -- the largest screens, the most memory and storage, a greater variety of I/O, and fastest performance. So there are many different reasons why desktops are really important, and in some cases critical, to people. It does seem odd to call out "greater variety of I/O" as a differentiator, when the latest MacBook Pro designs have dropped literally all outputs except USB Type-C. But for the Mac faithful, this is definitely something to get the rumor mill grinding.